The winters in Portland are long. And dark. And wet. To survive you need a plan. Mine involves running, regardless of the weather. Soon after moving here I realized that if I didn’t run in the rain, I wouldn’t run very often. Yoshimi says there’s an expression in Japan, “It’s only water.” It has now become my mantra. That all being said, even the Rainy Day Runner sometimes need a break. That’s why part two of my survival plan involves an occasional southern escape. Lucky for me both of my parents now spend winters in Florida. If you’ve never been to Florida, it’s very different from what you’d expect. Sure there are lots of golf carts, strip malls and early bird specials, but there are also tons of older folk living super active lives. These retirees are not just sitting around watching TV. They’re walking, biking, fishing, boating, swimming, and golfing. Everyday feels like Saturday and every hour like Happy Hour. It’s something really cool to see. Damn, makes me wish I was retired myself. This has been the third January in a row I’ve gone to Florida and this year I thought it would be fun to do a race while I was down there. I don’t know much about the Florida running scene, but I happened across an article in Runner’s World that chose Alafia River State Park as its trail of the month. The park looked totally unique, so different from anything here in the Pacific Northwest. 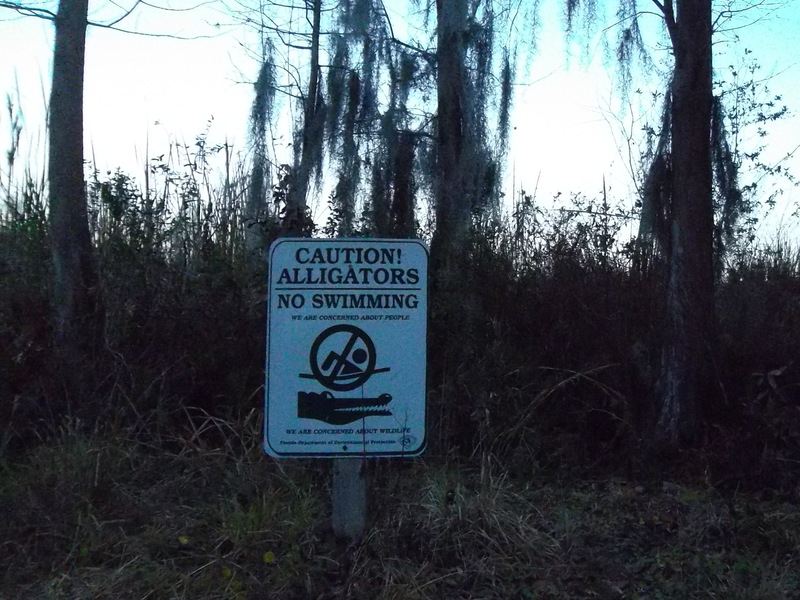 When I heard the trail runs alongside alligator-infested waters, I immediately signed up for its Florida Challenge Half Marathon. My brother Colin took up running this past year after reading Christopher McDougall’s Born To Run. Cole and I both have addictive personalities and running has had a positive affect on each of us. We talk about running over the phone, but never get a chance to train together because we live on opposite sides of the country. 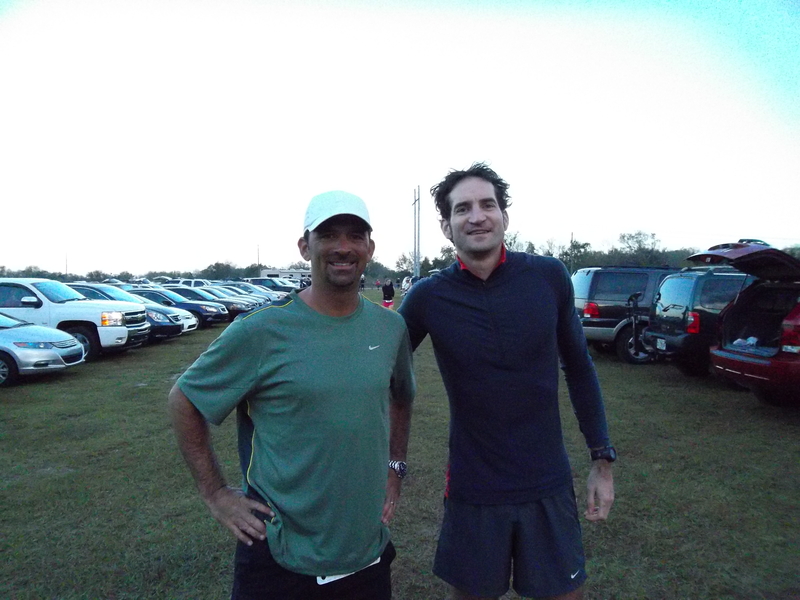 The Florida Challenge looked like the perfect opportunity for us to finally do a race together. We spent some time with Dad in Naples and then with Mom in Venice (who needs Italy) before driving up to Tampa for the race. Because of the publicity in Runner’s World more than 400 runners signed up for the race this year. The local Floridians were shivering in the pre-dawn 50 degree weather, but for me it felt like a typical Oregon summer day. The first half mile of the race was on road so everyone could spread out a bit before hopping onto the trails. There wasn’t an elevation profile on the race website, so I assumed that it would be Florida flat. And it was, but there were also lots of twists & turns and roots & rocks. Spanish moss hung heavy from cypress trees while the narrow single track trail ran along algae green swamp water. I didn’t see any gators, but I didn’t want to get all that close either. There weren’t any hills, but there were plenty of dips, steep drops in the trail that sometimes required you to use your hands to get back up the other side. They were like convex speed bumps and had a similar affect on pace. After a strong start I started to fade at around the half way point. My lack of training in the last few months became obvious. I was able to fake my way through a decent 10K a few weeks back, but a half marathon is not so easily fooled. I got passed by a women at around mile ten who seemed genuinely concerned when she asked, “Are you OK?” I must have looked even worse than I felt. The last few miles were miserable. The dips made me feel like I was on a roller coaster that refused to stop. I finished in 38th place, just before the day started to heat up. 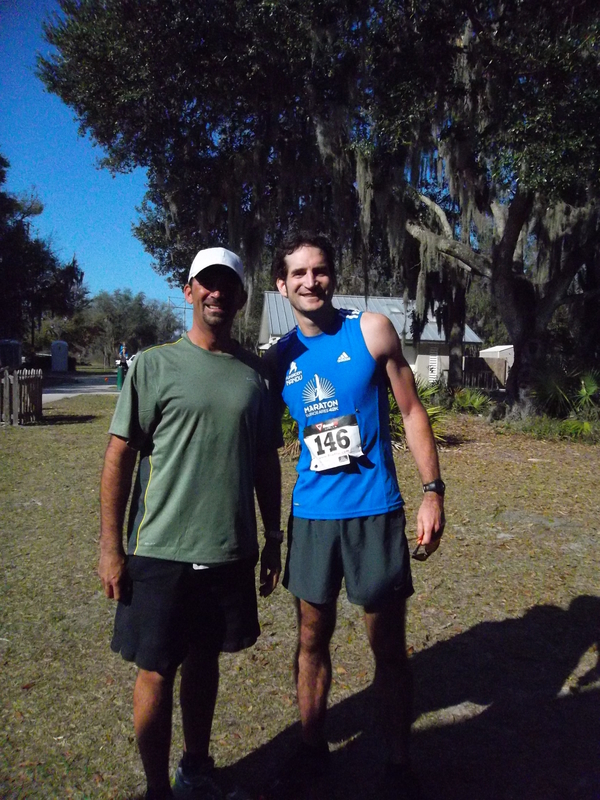 The Florida Challenge was Cole’s second half marathon. His goal for this race was to set a new PR(personal record). He trained hard these last few months, focusing specifically on this race. He started out at a conservative pace and got stuck behind a logjam of slower runners. Eventually he was able to pass one after another(more than 50 in all) before getting back to his planned pace. He finished the race looking strong and the first thing he said afterwards was, “I gave it all I got.” The hard work he put in paid off. He ran a smart race and PR-ed by more than 5 minutes. I’m so happy for him. On the drive back to Dad’s(where there were a couple of blackened grouper sandwiches with our names on it) we talked about new goals and future races. One thing that’s a given is another race in Florida next winter. It’s a new tradition worth keeping. Our sister, Erin, is also a runner, but not a racer. Maybe we can convince her to join us next year.